A heartwarming Christmas Classic that can be enjoyed by the whole family. A humorous tale of a young boy named Ralphie, with one thing on his Christmas list, a BB Gun. DEPARTMENT 56 A CHRISTMAS STORY VILLAGE "RALPHIE'S HOUSE"
Size: 8 x 6 x 6.5"
Inspired by the Department Store in the Warner Bros. movie "A Christmas Story". With nose pressed on the window, a youngster dreams of something from the window display under the tree on Christmas morning. Hand painted porcelain, with light cord. In stock soon. Order now to get in line. First come first served. 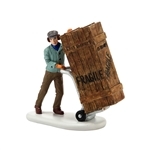 Inspired by the Department Store in the Warner Bros. movie "A Christmas Story". With nose pressed on the window, a youngster dreams of something from the window display under the tree on Christmas morning. Hand painted porcelain, with light cord. 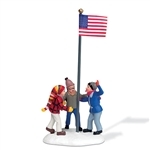 DEPARTMENT 56 A CHRISTMAS STORY VILLAGE "TRIPLE DOG DARE"
Size: 2 x 1.75 x 4.5"
COORDINATES WITH 805029 "CLEVELAND ELEMENTARY" In stock soon. Order now to get in line. First come first served. 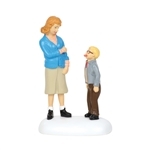 DEPARTMENT 56 A CHRISTMAS STORY VILLAGE "ISN'T IT BEAUTIFUL"
COORDINATES WITH 805028 "RALPHIE'S HOUSE" In stock soon. Order now to get in line. First come first served. 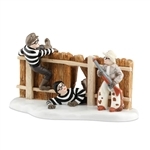 DEPARTMENT 56 A CHRISTMAS STORY VILLAGE "PINK NIGHTMARE"
DEC 2007- In stock soon. Order now to get in line. First come first served. DEPARTMENT 56 A CHRISTMAS STORY "RALPHIE TO THE RESCUE!" 2.875 in H In stock soon. Order now to get in line. First come first served. No "A Christmas Story" display is complete without a leg lamp that actually lights up. Powered by batteries, this piece includes an adapter. With great imagination Ralphie dreams with assurance about his A+ essay, which conveniences every one of his need for a new BB gun this Christmas. Scene taken from the movies.